Green Chimneys is a multi-faceted nonprofit organization helping young people to maximize their full potential by providing residential, educational, clinical and recreational services, in a safe and supportive environment that nurtures connections with their families, the community, animals and nature. 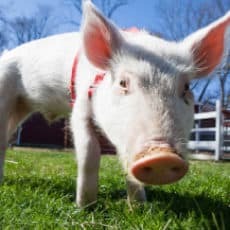 Founded in 1947 and headquartered on a farm and wildlife center in Brewster, NY, with a second campus in Carmel, NY, Green Chimneys is recognized as a worldwide leader in animal-assisted therapy and educational activities for children with special needs. Green Chimneys services include an accredited special education school on two campuses; residential treatment center; nature-based therapeutic programs; community-based support for youth and families; and public education and recreation opportunities for all ages. Each of our programs celebrates the dignity and worth of all living things. We are pioneers in animal and nature-based therapy, striving to create a harmonious relationship among children, animals and the environment through an array of educational, residential, recreational, and mental health services. Through innovative therapies and tools to teach critical life skills, Green Chimneys helps youth reclaim their childhood, discover their self-worth and create a future for themselves as independent, contributing adults. Green Chimneys is a 501c3 corporation. Programs and services are funded by private donations and grants from foundations, corporations and public agencies. Green Chimneys offers day and residential programs for students who have been unsuccessful in traditional education environments and who require a small, structured and supportive setting. Natural surroundings create a safe, therapeutic environment for students with special needs, incorporating innovative animal-assisted and nature-based activities. A nurturing approach features small class sizes, high staff-to-student ratio, and certified teaching staff to provide full academic, behavioral and emotional support for grades K-12. Our goal is to help students reach their maximum potential so they may return to their home school district with the best chance of success. Green Chimneys is home to over 200 farm animals, horses and unreleasable wildlife. The main criteria for animals in the program are that they play a supportive role with the children. Domesticated animals, such as sheep, goats, chickens, dogs and other animals accustomed to living with people make up the majority of animal residents and these are the animals that provide close contact with the children. Non-domesticated species such as eagles, hawks and owls live in our wildlife center. The children do not handle them in the same way they work with the farm animals and dogs; the philosophy behind working with wildlife is to teach that not all animals are there to be hugged. Some animals also come to Green Chimneys with a difficult history, which allows for productive metaphors with children who are overcoming challenges in their own lives. We believe that children thrive in an outdoor environment and are committed to teaching them how to preserve it. We collaborate with local and regional schools to provide ‘hands-on’ environmental learning through student trips to our 350-acre nature wonderland, which includes a Model Forest to promote learning and best practices in forest management and water conservation. Our farm and wildlife rehabilitation programs teach about the care of rescued animals while our organic farm and gardens incorporate nature study and sustainable practices. We provide comprehensive support services to at-risk, runaway, homeless, and foster care youth and families in crisis within Putnam County. An array of programs promote positive development, healthy choices and effective family communications, along with social supports and service coordination for youth in need of higher level interventions. Nature’s Nursery provides year-round preschool and quality after-school programming, and accredited day camp programs for children and teens are offered at our Hillside and Clearpool Summer Campsites. Family-friendly events and activities are held throughout the year, and we encourage weekend visits to our Farm & Wildlife Center. For a taste of Green Chimneys, visitors can bring home fresh produce, organic products, and local crafts from our own Boni-Bel Farm & Country Store. Explore our website or follow us on Facebook and Twitter for news and upcoming events. We hope to welcome you soon! Advance your career and join a dynamic team of professionals who are dedicated to helping children and families thrive. Positions range from teachers and social workers to office staff, animal caretakers and more. Make a difference in the lives of Green Chimneys children and animals by sharing your time and expertise.